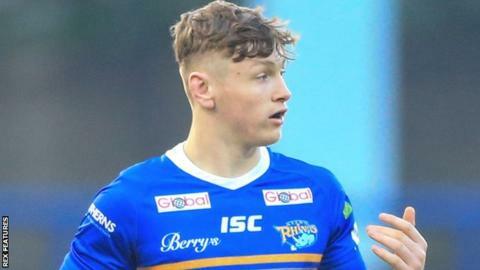 Harry Newman scored four tries as Leeds beat League One side Workington Town in the fifth round of the Challenge Cup. The hosts led 42-6 at the break, with Liam Sutcliffe grabbing two early tries and Newman scoring a treble. Richie Myler had a hat-trick in 16 minutes either side of the interval and Newman ran-in his fourth, while Sutcliffe converted every try to add 26 points with his boot. Workington's only response came through Caine Barnes, converted by Carl Forber. "Our start was really good - we talked about starting fast, but in the last 20 minutes of the first half our completions weren't so good. "That was the negative but the opportunities were there to defend our line which we did and all three debutants (Owen Trout, Callum McLelland and Muizz Mustapha) all performed well." "I thought the occasion got to us too much and we looked like we were startled in headlights for about 15 minutes. "Some of the tries were pretty soft and some of the one-on-one tackling was poor. Once we got into the game we did well for a period." Leeds: Lolohea; L Briscoe, Watkins, Newman, Golding; Sutcliffe, Myler; Albert, Parcell, Singleton, Ferres, Trout, Donaldson. Interchanges: Peteru, Jones-Buchanan, McLellan, Mustapha. Workington: Mellor; Walsh, Worthington, Singleton, Rooke; Doran, Forber; Wilkes, Olstrom, Scholey, Barnes, Maudling, Tickle. Interchanges: Dawson, Moimoi, Farrell, Hopkins.